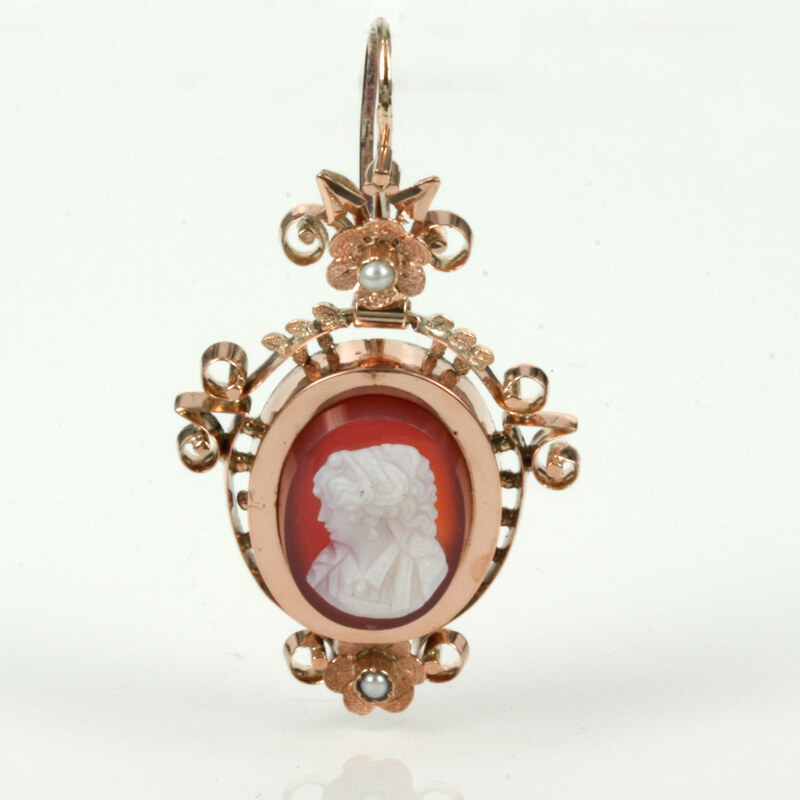 Product code: ES1294 Categories: Antique, Antique Cameo, Antique Earrings. Antique cameos are so individual and here is a magnificent pair of antique cameo earrings dating from the 1870’s. More commonly cameos are found carved from shell, whereas these cameos are hand carved from sardonyx which is a naturally layered material of white and the lovely warm burnt orange colour. Made in 15ct rose gold, the colour of the gold matches so well with the colours from the sardonyx and it really makes these antique cameo earrings stand out even more. Each earring is also set with 2 pearls to add even more charm and character to them. Measuring 25mm across at the widest part in the centre by 38.5mm from the bottom to where the shepherd hook is attached, the size of these earrings really stand out so well day or night. The shepherd hook fittings at the back are also nice and long making them very secure to wear. Antique cameo earrings are becoming increasingly hard to come by as it only takes the loss or damage of one to make them obsolete and these earrings are not only still together well after 140 years but are also in superb condition.